Lights and action at the Shore Leave Part at the WWII Museum at New Orleans’ Tales of the Cocktail. 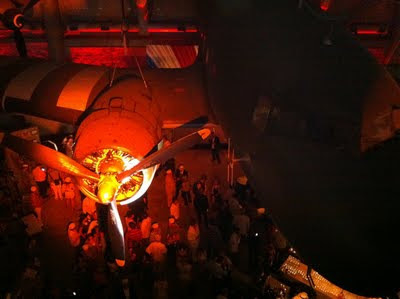 The Shore Leave Party at the WWII Museum was insanely fun. We started out chatting with journalist Michael Anstendig over some Hudson corn whiskey lemony highballs that were easy to sip and a great way to cool us down. Then, we ran into the gentlemen from Templeton Rye, who slipped us a flask filled with their smooth as silk spirit (we’ve been making Templeton Rye Manhattans with them all summer, and cannot stop!). Thanks, fellas, for the hooch! Also dishing out cocktails made with Milagro tequila, orgeat, horchata, coconut milk, and dashes of some other tasty ingredients was Jaime Salas, a fellow Brooklynite (who as a Brand Ambassador of course is rarely in his home city). Thanks for chatting with us and providing us one of the many fun photo ops available throughout the event. 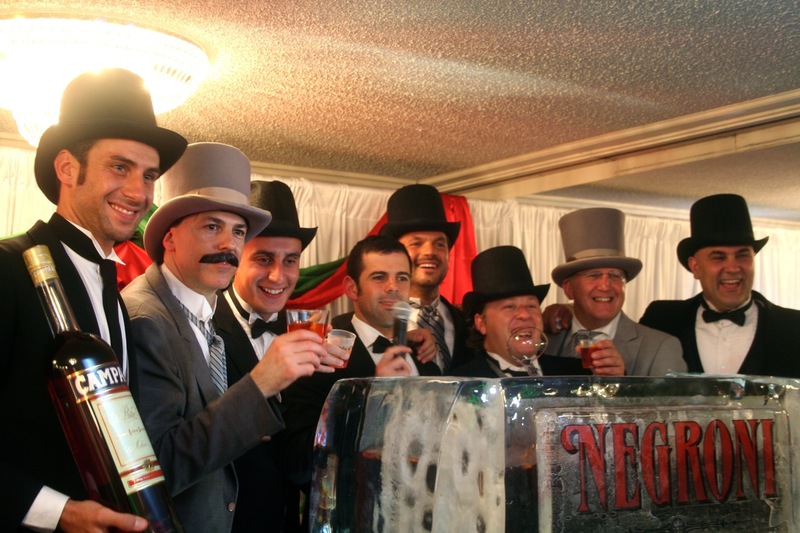 We caught the tail end of the World’s Largest Negroni event. Wall-to-wall imbibers eagerly sipped, from a flagon of thick ice, one of our favorite cocktails of all time. This Negroni was special though; besides the bittersweet musings of Campari and Martini & Rossi sweet vermouth, the classic drink boasted the slightly sweet and tea-tasting Beefeater 24, which we lauded a couple of years ago during its launch in the U.S.
Raising a glass to the world’s largest Negroni, at Tales of the Cocktail 2011. Pour ingredients into a rocks glass filled with ice then stir and serve. Garnish with a slice of orange. 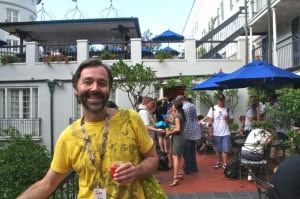 Steve Schul enjoys a Negroni at the World’s Largest Negroni event. 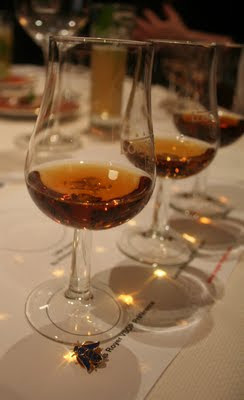 Of course, the largest smattering of various spirits was presented by Diageo at the Cabildo Museum. Dubbed “Cocktails from Around the World,” 50 bucks got you a sampling of dozens of cocktails mixed by the world’s most flavor-savvy cocktail creators. We tried new concoctions by Lynnette Marrero, Joaquim Simo, Ryan Fitzgerald, Enrique Sanchez, Misty Kalkofen, Dänny Ronen, Fred Sarkis, all of which satisfied our taste buds, to say the very least. We could have drunk all night, but, well, a sip of each was just enough to make us happy. 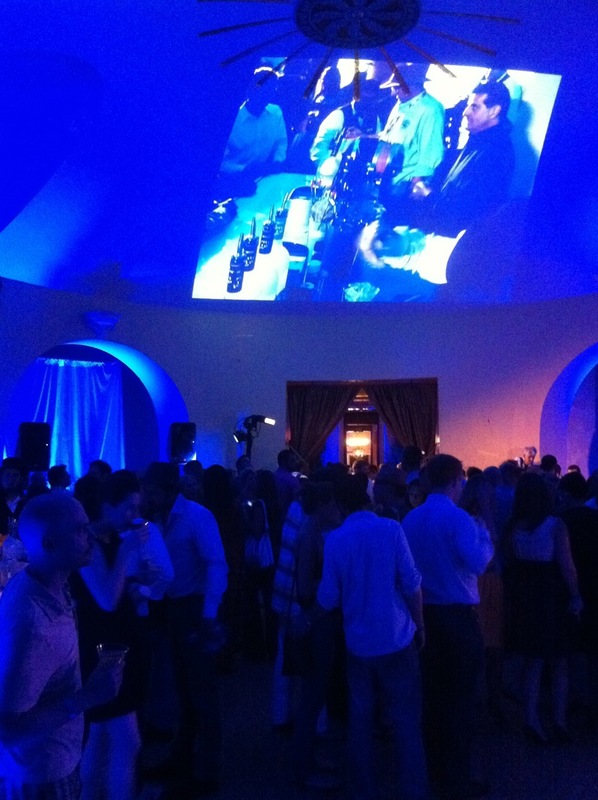 Cheers to Lynnette Marrero for creating a delicious Black Daiquiri for the Diageo event. One of the most fun events was Purity Vodka’s make-your-own infused bloody mary–style martini. Bartender & brand ambassador John Pomeroy Jr. guided us through the process, which involved dumping your favorite bloody mary ingredients into a siphon, adding Purity vodka, charging it with CO2, giving it a little shake, and straining it into a cocktail glass with a lovely ice orb. We, along with fellow cocktail writer (and our logo illustrator) Dr. Bamboo, experimented with a variety of ingredients. But our favorite? Shrimp, andouille, okra, peppercorn, green bean, salt, and tomato. It tasted like New Orleans in a glass. You must try this at home! Use a cream siphon so it’s a little more manageable than a big soda siphon. Thank you Purity for provided a jazz trio and an amazing spread, in the cozy Bombay Club. Tasting rooms are very creative these days, and just tasting an unmixed spirit simply is not enough apparently anymore at Tales. Some of these, such as the Sandeman Ruby Port tasting, went all-out. 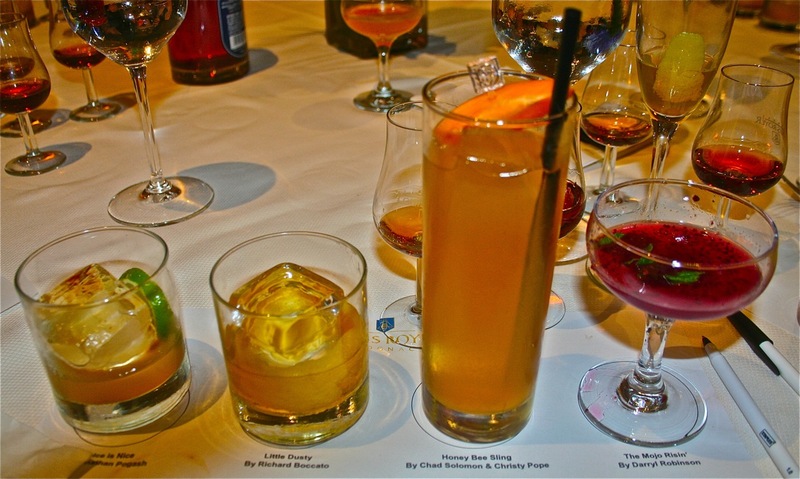 At this tasting, where a cocktail competition was taking place, we were treated to three unique drinks created by three very talented bar chefs. Steve loved Don’s Dram by Andy Minchow of Holeman and Finch in Atlanta; Paul, the Red Cape Cocktail by Adam Sieczka. Also on hand was Cheryl Scripter from Bittersweet Confections here in New Orleans who encouraged every passerby to sample all the truffles at her table. Ruby Port and truffles are indeed a marriage made in Elysium. Muddle blood orange and basil leaves with simple syrup and lemon juice. Add port and rye whiskey. Add ice. Shake and pour into a rocks glass. Garnish with blood orange slice and basil leaf. Combine ingredients in a mixing glass. Add ice and shake for five seconds. Double strain into cocktail glass. Garnish with a pinch of sea salt and one grind of black pepper. Let us continue into the realm of something new: Cupcake Vodka. We were so intrigued by the name, we had to stop by for a sip. Let us tell you that these vodkas are not in the least bit cloyingly sweet. Touted as all-natural, they are easy to sip, fun to mix, and are worth more than a try. Our favorite expression was the Devil’s Food. A truly interesting find. It got our creative minds racing. A few minutes later, we found ourselves in the Drambuie tasting room. We are very familiar with Drambuie, and were eager to try its new product, one which is peatier and slightly less sweet than the older model. We chatted with Anthony Caporale who created a delicious creamy lavender Drambuie concoction that we would have killed to have a scone with. And on the opposite spectrum of taste, there was a global-inspired Drambuie drink with lemongrass and jalapeños that made us reconsider that Drambuie is limited in what you can do with it. We love surprises. Kilbeggan, aged in bourbon barrels, was a lovely way to reacquaint ourselves with blended Irish whiskey. The aroma is slightly sweet and rich, with vanilla and, of course, bourbon. A nice change from the usually Irish whiskeys aged in sherry barrels. 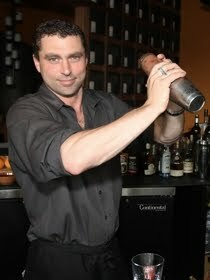 We are looking forward to mixing with it in some of the cocktails we’ve developed when we get back to Brooklyn. 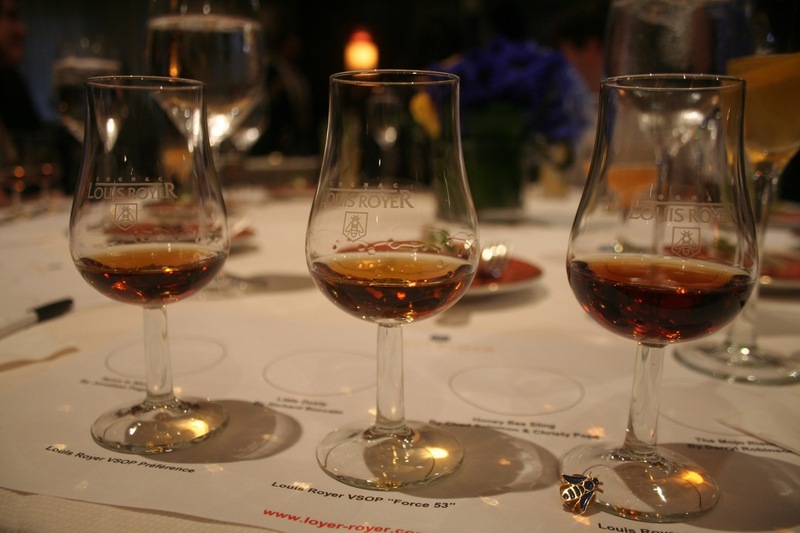 Other welcomed tastings didn’t involve alcohol at all. Barritt’s ginger beer is a lovely addition to the ginger beer canon: light and refreshing, and served by rep Paul Imbesi, donning some sweatbands around his head and wrists. We dubbed him the Olivia Newton-John of the Tasting Rooms. Never lose your sense of humor, Paul! We’ve talked about Fentimans sodas in our previous post, and we are excited to experiment with the Rose Lemonade in future drinks. What a great tasting room, with so many of their soda flavors on hand, being mixed with all kinds of spirits and liquors. If you haven’t tried the Dandelion and Burdock soda, you are missing out! More tasting notes to come. Stay tuned. Thanks to all the hard-working men and women who gave us their time. Cheers! The Cognac Summit was the first cocktail we imbibed after we landed in New Orleans. Shaken at the Tales of the Cocktail Media reception at the French 75 Bar in Arnaud’s in the French Quarter, it was a smooth and extremely well-balanced introduction to a week of revelry, seminars, and meet-and-greets in this southern city that never seems to sleep. Lightly muddle the lime zest and ginger slices in a rocks glass with the cognac. Fill glass half-way with ice. Stir well for 5 seconds. Add lemonade and cucumber peel. Stir well for another 5 seconds. As we filled up on piquant gruyere-laden gougères (which pair perfectly with the Summit Cocktail, by the way), and other assorted tasty nibbles, we met costumer Thayer Abaigael and her husband Scott Lund, recent transplants from San Francisco who have completely embraced the NOLA way of life. The sultry air mixed with savory conversation, plus a French 75 made with cognac and lemonade, led the four of us to a pizza joint not too far from Arnauds where we continued our conversation about Tales and the city. Scott developed the extremely user-friendly Droid app for Tales this year (they should have asked him to develop the iPhone app as well), and Thayer runs the Vieux Carre Media breakfasts and lunches that have turned out to be the saving grace for us during our stay thanks to the amazing food and the opportunity to rub elbows with the executives and distillers who sponsor everything at Tales. Hollis Bulleit always has time for a photo and a hug. In the Vieux Carre Room at the Hotel Monteleone, with Paul Zablocki of Cocktail Buzz. She grabbed us by the arms and said, “you must meet my father,” and led us to Mr. Tom Bulleit, founder, and sixth-generation distiller, who rose from his chair mid-bite, and took the time to talk to us a little about the family biz, but, more important, about the films he loved, and those we shared a common admiration for. He was warm and generous with his time. We will be watching McCabe and Mrs. Miller and Cannery Row when we get home, Tom, we promise. Some other new friends we met in the Vieux Carre Media room, and who we’ve been running into again and again, hail from Vancouver: Craig James, the CEO of Fentimans, and his sharp-as-a-tack daughter, the lovely Samantha. They asked us if we had the opportunity to sample their products at one of the Tasting Rooms, and we were quick to respond with a resounding “yes!” Our favorites are the Dandelion and Burdock, Rose Lemonade, and Shandy, but they’re all good, and a much needed and refreshing respite from a cocktail-heavy day. Getting back to Scott and Thayer, that first night after pizza and salad, we wandered to the Grey Goose party at Latrobes’s on Royal Street where it seemed all of NOLA’s beautiful people converged. We were greeted by a spectacle of lights, camera, and action adorning one NOLA’s most architecturally significant buildings from 1818 in the heart of the French Quarter, a stunning place to sip a barrel-aged cocktail by Guillaume Jubien and Nick Mautone. Consisting of Grey Goose La Poire, Noilly Prat dry vermouth, Monin white cocoa syrup, this “Feu d’Artifice” is barrel-aged 2 to 3 days and after some stirring in ice, garnished with a lemon peel. A highly flavorful—but not too sweet—unique and satisfying after-dinner drink. It was then time to hit the hay. Thanks Hotel Monteleone for such a gorgeous room! Grey Goose party at LaTrobe’s in New Orleans. Flashy lights and videography, pulsating music, and custom cocktails. Ribs at Cochon, finger-lickin’ awesome. Don’t forget to wash it down with a bourbon cocktail. New Orleans. It’s one of those cities that you can instantly fall for, and we have. Amazing food and cocktails beckon throughout its wards. There are so many choices to ponder and old favorites to revisit. 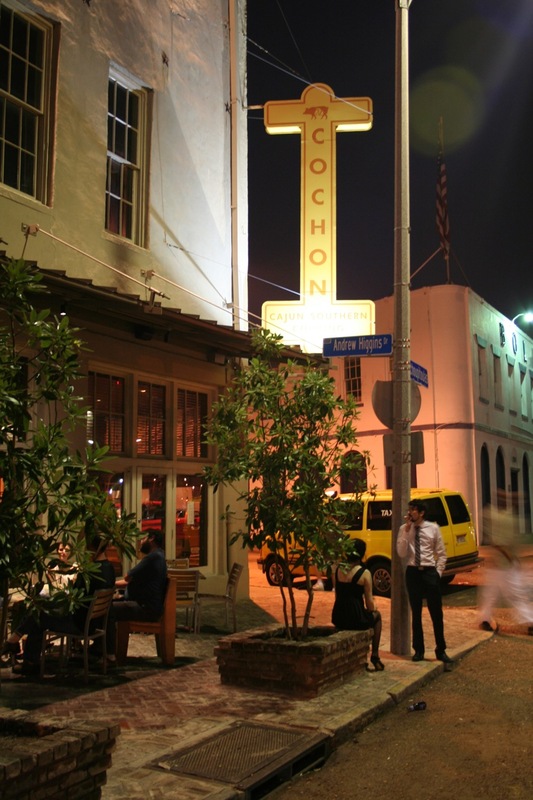 This year we are yearning for some more Cochon, a Warehouse District favorite that made us believers in the power of pigs ears, fried crispy like pommes frites and perfectly paired with any one of their great bourbon cocktails. We first happened upon Cochon in 2008 during Tales of the Cocktail and have been happily coming back since. Authentic cajun cuisine from James Beard–award-winning chefs Stephen Stryjewski and Donald Link in a open kitchen setting, comfortable, casual, and excellent food. A favorite chef of ours is John Besh. Having visited his restaurant Luke, a Franco-German brasserie that’s delicious and bustling, and Restaurant August his flagship that elegantly executes his farm-to-table food in a room of exposed brick walls and crystal chandeliers, we are eager to try La Provence, outside the city over Lake Pontchartrain, that has an actual working farm outside its door. Another stop on the Besh tour is the new soda fountain, Soda Shop, in the National WWII Museum on Magazine Street. Those breakfast biscuits with a hand-crafted pineapple soda sound good before another day of imbibing in the city that loves its cocktails. We’re visiting another of the great chefs at Emeril’s New Orleans where friends have commanded us to “get the fried oysters!” And we’re intrigued by whats listed simply as “Mac n’ Cheese” on the menu, this version with gulf shrimp, vermouth cream, and guanciale. Hey, you’re in New Orleans, you’re eating rich. Just remember to follow each visit to the city with a week of big salads to counterbalance these outings. Another good place to soak up those cocktails is Mother’s Restaurant. Since 1938, Mother’s has been serving up New Orleans home cooking featuring Po’Boys and breakfast all day. Authentic to say the least. 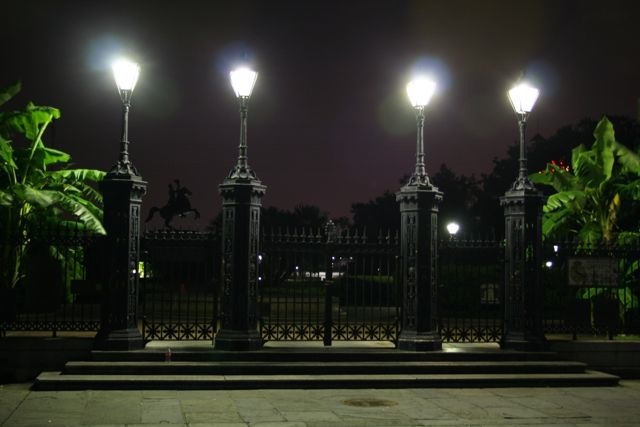 The French Quarter, at night. GW Fins in the French Quarter is famous for its seafood, and we are scheduled to sample it during the Spirited Dinner series offering, where a cocktail will be paired with each course. 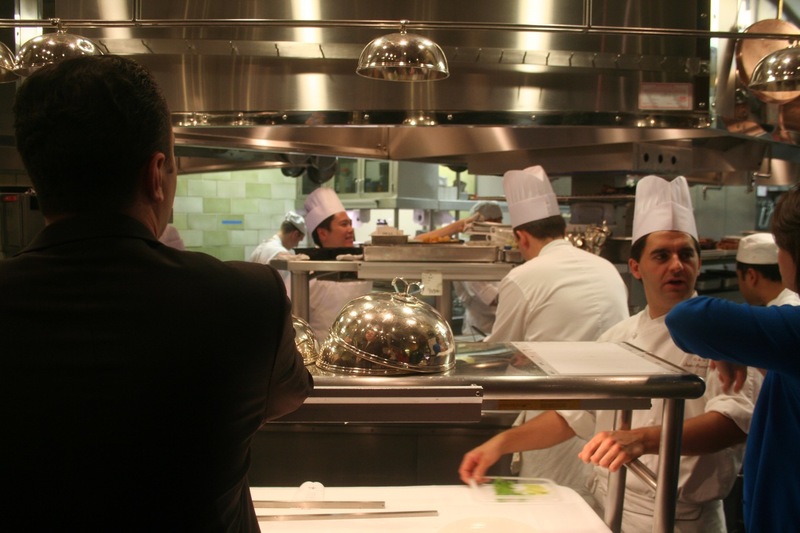 We heard some chatter about Coquette, a little bistro and wine bar, and we’re intrigued. 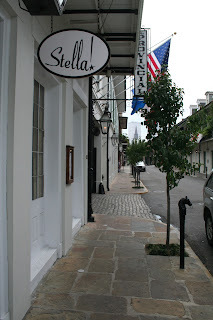 It looks like a hidden gem in the Garden District, with a menu that changes daily, and fine crafted cocktails. 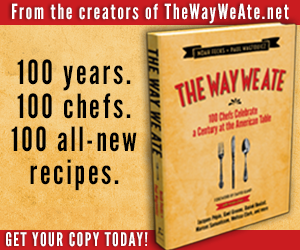 Interested in New Orleans fare inspired by a hometown chefs five years spent in Hawaii soaking up Polynesian culture? 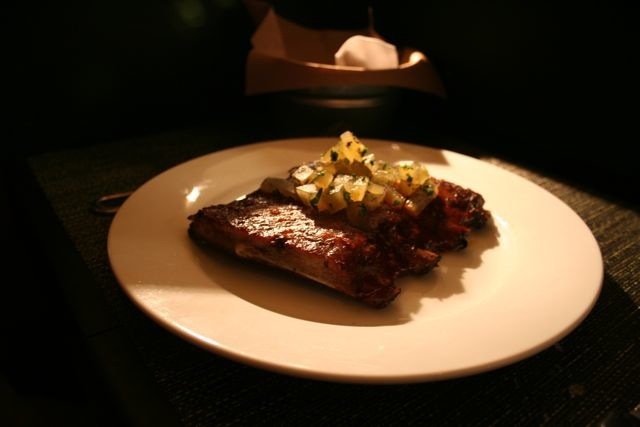 Sounds good to us, so Mike’s on the Avenue made our list. The flash-fried oyster salad with a sesame guacamole and tomato ginger salsa is also on that list. 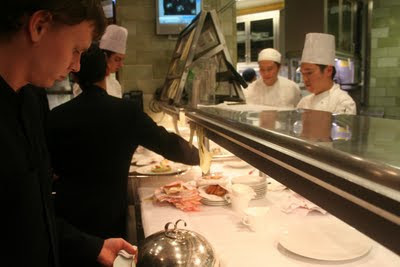 Don’t pass up a chance to dine at Stella!, a fine-dining experience not too be missed. 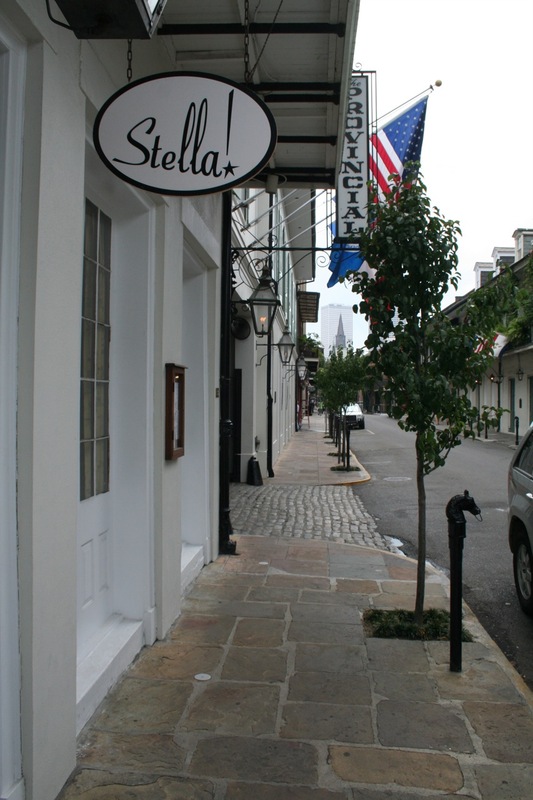 On a quiet street in the French Quarter, this intimate space is an outstanding dining option. 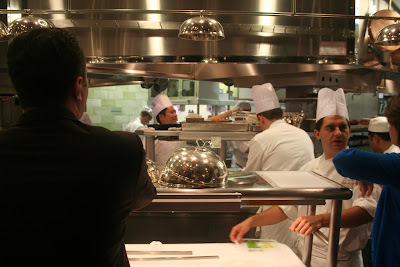 When we were last there, Chef Scott Boswell had brought in fresh herbs for that nights meal from his own garden. When we were last at Stella!, we met Neal Bodenheimer, the man behind Cure, a fancy watering hole that hearkens back to the day when cocktails, and the small plates and bar snacks served with them, were an enjoyable and social way to while away the pre-dinner hours. And do not forget Cafe du Monde. Touristy and packed, but oh so good! A perfect way to greet the early morning hours with warm fried beignets generously dusted with powder sugar, and a cup of chicory coffee to wash it down. But there are other places to try still, so many in fact. Don’t despair, as New Orleans always merits another visit. Like a siren’s call, it’s one of those places that keeps calling you back. Left Coast vs. East Coast Libations: A Spirited Dinner Romp That Promises Four Courses (Plus Amuse) and Ten Cocktails. Hijinks Guaranteed. One of the events we look forward to every year at Tales of the Cocktail is the Spirited Dinner® Series, and our choice this year promises to be a gentle and humorous battle between several bartenders from the Left Coast (which comprises Vancouver all the way down to San Diego) and the East Coast (from Boston to Miami). The venue, GW Fins seafood restaurant. Our host, Ted Munat, co-author of Left Coast Libations, a cocktail book extolling the virtues of the other coasts’ top bartenders. Ted promises to “guide us through a comedic journey into the East/West ‘Rivalry’ of the cocktail nation, featuring 10 star bartenders from both coasts in round by round battles for supremacy.” Supremacy and battle might sound a bit heavy-handed for an event in which the bartenders all seem to get along, no matter from which coast they find themselves behind the stick. 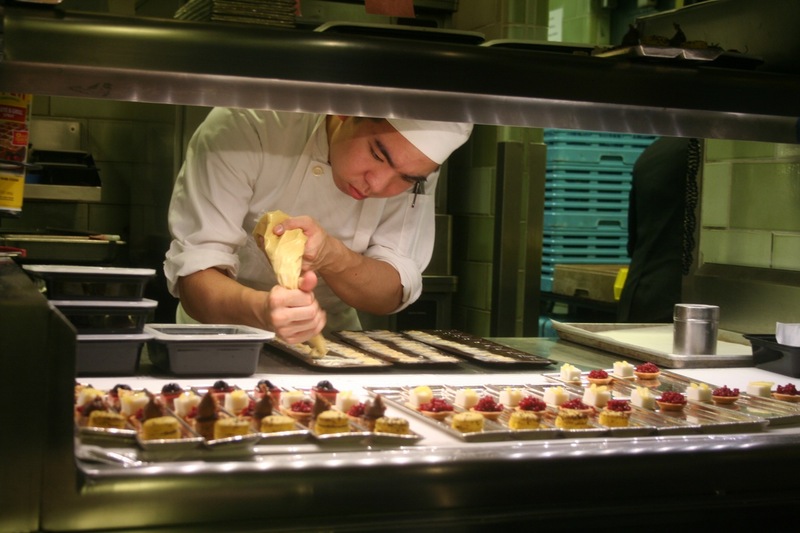 But hyperbole, mixed with alcohol paired with tasty cuisine prepared expressly for the event by Chef Mike Nelson, sounds like the perfect recipe for an evening charged with bold flavors, and a variety of shaken and stirred styles. According to the press release, “Theatricality will of course be immense. Laughs, tears, and intense realizations are guaranteed.” Bring it on! 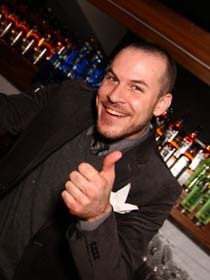 In coming up with the idea for the drink, Jason found inspiration from Cachaça Dave (tastemaker Dave Catania), who shared a phrase with him one day when he was working behind the bar at Dram. “Behind God’s Back” is bandied about a lot in St. Lucia, where Chairman’s Reserve Rum is born, and refers to “something that was very far away . . . on the other side of the island.” After a little tinkering, this tiki-influenced cocktail was born. Chef Nelson is hoping that the flavors of the cocktails mingle wit the “tartness of grapefruit, acidity of tomatoes, and sweetness and spicy aspects of the Vietnamese Glaze on the Pork Belly.” We can’t wait to taste the results. Shaking and stirring behind the bar at Seattle’s Liberty Bar, of which he is a co-owner, Keith Waldbauer is poised to pair the Fourth Course, a Warm Roasted Pineapple with Coconut Sorbet, with his potion he dubs the Oaxacan Flip. And drink we will, as these top bartenders duke it out wearing wide grins and kid gloves this coming Thursday at GW Fins. 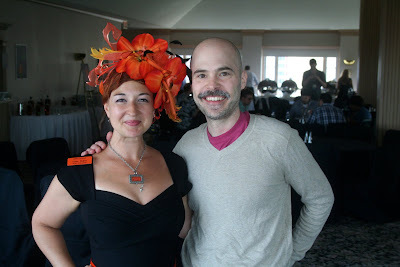 To read more about the GW Fins’ Left Coast vs. East Coast Libations Spirited Dinner, and find out what Dave Shenaut really thinks about the competition, check out Francine Cohen’s piece on Inside F&B. The GW Fins Dinner is sold out, but you can probably add yourself to the waiting list by calling 504-581-3467. 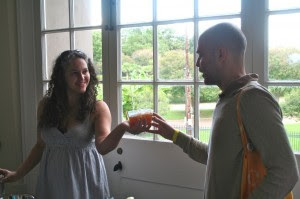 Tales of the Cocktail, the annual New Orleans celebration of, you guessed it, the cocktail, is fast approaching, and the list of events, seminars, and tastings is staggering. As members of the media, we are asked to attend five of the fifty-five seminars on offer. Narrowing down our choices wasn’t easy. So many of the seminars that we wished to attend overlapped, but we managed to be quite pleased with those we ultimately chose and are looking forward to hear what the pros have to say. 1. One of the already sold out Pro-Series seminars (for professionals working in the spirits industry) we’ll be attending is simply titled “Brand Ambassadors.” This seminar—sponsored by Belvedere Vodka and hosted by such cocktail and spirit luminaries as Angus Winchester, Simon Ford, John Lermayer, and Allen Katz—promises to dissect the role of a spirits brand ambassador, a position that has piqued the interest of many a star bartender, and comes with the possibilities of travel, an extravagant expense account, and constant parties, interviews, and spreading the word of spirituous enlightenment. We’re sold. 2. Another sold out Pro-Series seminar—which immediately piqued our interest—is titled “Intellectual Property 2,” sponsored by Absolute Vodka and Plymouth Gin. We missed last year’s seminar, so were very excited to have nabbed some seats for this one, which will focus on protecting your original ideas, with some emphasis on the rights of bloggers, like us. 3. The non–Pro-Series seminars that make up most of the Tales of the Cocktail roster are more creatively titled, such as “The Bad Boys of Saloons,” which quickly caught our eye. Authors Christine Sismondo and James Waller will band together to discuss the “seamy side of the saloon trade,” in which drinks with names such as Mule Skinner, Pop-Skull, Nockem Stiff, Rattlesnake, and Tonsil Varnish were served in joints sometimes referred to as Hell-on-Wheels and Hangdog Bars. Low-life booze delights are promised. 4. It’s always fun to trace the history of a particular cocktail, and this year’s winner is one of our favorites: the Mint Julep. Just thinking about sipping one on a sweltering summer day almost brings tears of joy to our eyes. “Persia to Ponies—Julep Journey,” hosted by a panel of Australian award-winning drink educators (! ), aims to limn with humor the development of this bourbon-mint-ice drink, from its roots in Perisa, through the post–Civil War era, right up to the modern age (did we just hear the words Kentucky Derby?). Giggles are guaranteed, as well as juleps galore. 5. Spirits writers David Wondrich and Wayne Curtis, along with moderator Paul Clarke, tackle the ever-widening field of spirits writing in their seminar titled “Drinking on Deadline.” (It really is difficult to write about a spirits event after sipping nine different cocktails with very little food in your belly—trust us.) Book, magazine, and online spirits writing will be covered in all from starting up your own blog, to great spirits writers both pioneering and recent. For a description of all seminars, click here. Description of all Pro-Series seminars, click here. Tales of the Cocktail runs from Wednesday, July 20, through Sunday, July 24.